Situated less than an hour northwest of Boston and just down the street from growing towns like historical Concord and scenic Harvard, Acton delivers the best of both worlds: A tightly-knit, small-town feel, with many of the amenities the big city has to offer. Perfect for families both big and small, Acton was first settled by Native Americans centuries ago. When colonists settled in nearby Concord in the 1600s, they first used Acton merely as grazing fields for livestock. It didn’t take long for them to see the potential in the area, however, and in 1735, Acton was established as an independent town all its own. As time went on, Acton became a leader during the Industrial Revolution, complete with gunpowder mills, gristmills, sawmills and a stop on the popular Fitchburg Railroad. By 1874, the town had grown to nearly 2,000 residents, had its own library and published its own newspaper. Since then, Acton has continued to grow year after year. Today, it clocks in at nearly 22,000 residents, encompasses 20 square miles of land, and is home to an arboretum, various sports fields and complexes, two libraries, a number of museums and historical sites, and several local theater groups. Residents also get to enjoy a number of community-wide events, including the Lions Club Town Fair, the Independence Day Celebration, Monsterbash and loads of local concerts and performances year-round. 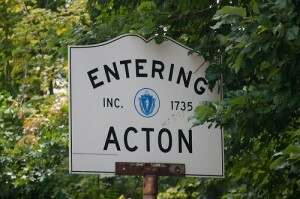 Acton also boasts of a commuter rail within the town, making daily commutes into Boston a breeze. Though Acton certainly offers plenty to see and do, it’s not all fun and games here. The town is also overflowing with educational opportunities. Students in K-12 attend schools in the Acton Boxborough Regional School District, which contains five elementary schools, each of which abides by a different educational philosophy. Some emphasize phonics, while others use a whole language approach to reading. Still others offer ESL programs, and some even operate on a project-based curriculum or allow students to call their teachers by first name. This district is also unique in that it doesn’t “assign” children an elementary school. Instead, parents choose their preferred schools, and a lottery-based selection process determines which campus the child will attend. This sort of educational strategy fosters a more tightly knit community, breaking down barriers between neighborhoods and subdivisions, and allowing children and families from all over Acton to meet, connect and support each other. The junior high and high schools in ABRSD are something to write home about, too. In fact, Boston Magazine named Acton-Boxborough Regional High School the No. 3 high school in the state in 2014. It was also named a Blue Ribbon School by the U.S. Department of Education and was ranked No. 7 in STEM education by U.S. News & World Report. Though a town overflowing with so many amenities and opportunities may seem out of reach for some, Acton can be quite an affordable place to live, considering the costs of surrounding towns in the area. Real estate runs anywhere from the high $200,000's for a small condo to half a million for a well-maintained mid sized home, all the way upwards of $1 million for a newer and/or larger home. A popular family town, the majority of housing stock is single family dwellings, made up of many colonial, ranch, and cape style homes. With everything this town has to offer, it’s no wonder Acton was named Money Magazine’s “Best Places to Live” list multiple times over. Come see for yourself just how great living here can be.